Many people in the Western United States get their first real introduction to reptiles from Sceloporus occidentalis, the Western fence lizard. This small grayish-brown lizard has a covering of shiny blue scales on its belly, giving rise to the better-known name of "blue belly lizard." They make interesting pets if you can catch one without it shedding its tail, but they’re also fun to observe as they clamber over trees, sand and rocks in the wild. Lizards are cold-blooded and without enough heat they become slow and lethargic and can’t digest their food. Western fence lizards do best with daytime temperatures between 75 to 85 degrees Fahrenheit, and nighttime temperatures around 62 degrees, though they can survive if it gets colder. In the wild, blue belly lizards will bask on a rock or other sunny spot to soak in the warmth; in captivity they need a safe heat source. Blue belly lizards eat bugs of all kinds and will catch them on their own in the wild. Small lizards eat insects such as ants and baby crickets. As the blue belly lizard gets bigger, he will add larger prey to the menu, including spiders, earthworms, mealworms, waxworms, larger crickets and grasshoppers. A blue belly in captivity needs much the same diet. Many of these foods are available from pet stores when the weather makes it hard to find them in the backyard. They drink water either from small puddles or by licking mist or dew from the leaves of plants. Male blue belly lizards are territorial and need plenty of space in which to establish themselves. Never keep two males together in captivity. 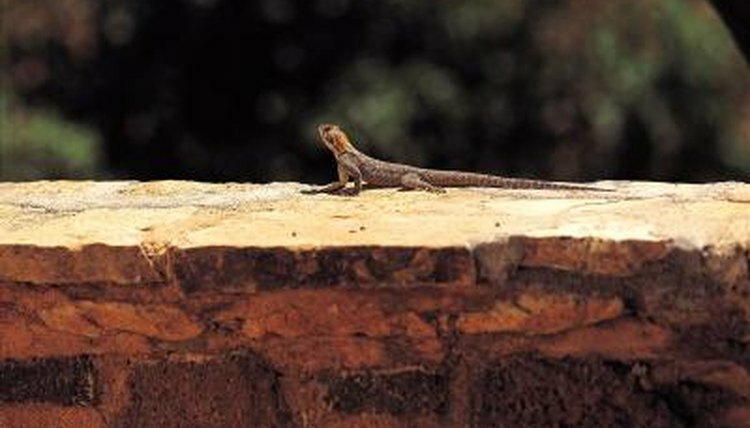 These lizards are very adaptable and make their homes in many different places, such as among rocks, in downed trees or in and around firewood cut and stacked near human homes. In captivity they should have sticks to climb on and pieces of bark or stones that they can climb on or hide under. Blue belly lizards are sometimes preyed upon by ticks and other parasites, but these little lizards have a secret within them that science is working to unlock. When bitten by a tick carrying the bacteria that causes Lyme disease, Borrelia birgdorferi, the lizard’s body is able to resist the disease and kill the bacteria without getting sick. Even more incredible is that after an encounter between a tick and a blue belly lizard, not only is the lizard free of the bacteria, so is the tick, through the action of a protein in the lizard’s blood.